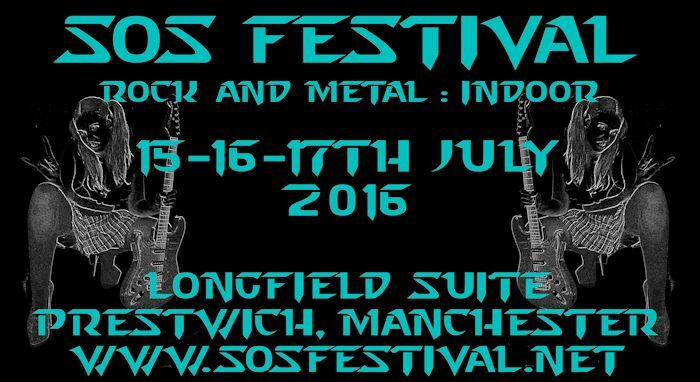 SOS FESTIVAL 2016 TAKES PLACE AT THE LONGFIELD SUITE, PRESTWICH, MANCHESTER. M25 1AY. 15th Oct : News is breaking today that our venue for SOS Festival (Radcliffe Civic) is set for demolition/re-development in 2016, prior to our next event. Although the re-development is not 100% certain, as always we're on the case & a completely viable local alternative venue (should we need it) is already reserved for our festival, within easy reach of hotels which already service our audiences/bands' needs, with similarly good parking availability & transport links. All is good! 17th July : BABYLON FIRE, THE IDOL DEAD, LORD VOLTURE & AONIA are the first bands announced for SOS Festival 2016!